For this analysis summary, we’ve prepared no less than 3 charts, because of the volume of updates and the long time period covered in this post. 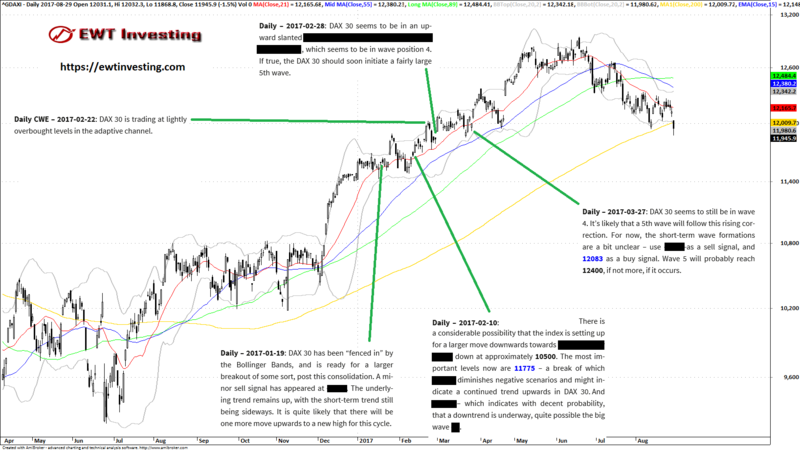 Some of the analysis comments are slightly redacted to preserve space – and the greatly simplified charts we use for these updates are free of Elliott Wave markings, in contrast to the information rich charts in the subscriber’s sections. Also, we don’t include every single update made during the time period, only the ones which contain new analysis conclusions or significant changes to the Elliott Wave analysis. Here’s the first chart (click to open in new browser tab). 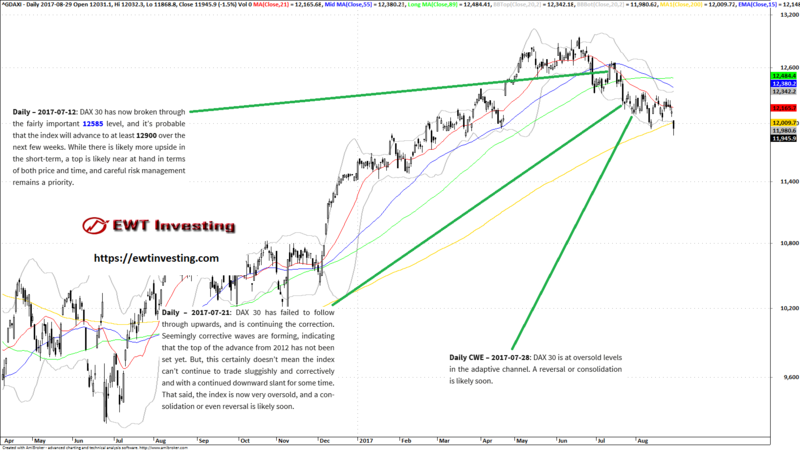 On the 19th of January, we wrote that a continued uptrend was a likely outcome. However, at the time we expected just one significant wave upwards, and not the entire subsequent advance. That line of thinking was evident in the update of the 10th of February, when we were more bearish. However, we also pointed out that a break of 11775 would invalidate our negative scenario, and probably lead to an uptrend, which is what happened next. Not exactly a clear forecast, but our knockout level was correctly selected and did lead to a significant continued uptrend. On the 22nd of February, we pointed out that one of our systems was showing an overbought signal, and this led to a period of net sideways price action for 2 months, as well as an immediate retreat. On the 28th of February, we pointed out that a corrective formation was likely ongoing, which would lead to a breakout upwards at a later date. However, at the time, we thought said breakout would arrive quicker than it did. On the 27th of March, we reiterated our call for a breakout to reach 12400. This almost happened a trading week later, but DAX 30 actually stopped at 12375, just short of 12400. On the updates for the 19th and 21st of April 2017, we suggested that DAX 30 would soon breakout strongly towards at least 12500. On the 10th of May, we warned that DAX 30 was very overbought and was probably close to a major top. In hindsight, we got price almost right, but the timing was off somewhat, because a considerably decline didn’t immediately follow. On the 19th of May, our renewed analysis indicated that the advance wasn’t necessarily completely done, and offered a trigger level which would more or less confirm that there was still some distance left to go for the market. On the 16th of June, we suggested a short advance towards at least 12922+ remained, as well as reiterating our belief that a high-risk situation had developed. This was a great call, and the DAX 30 made a short advance to 12951.5, before topping out. 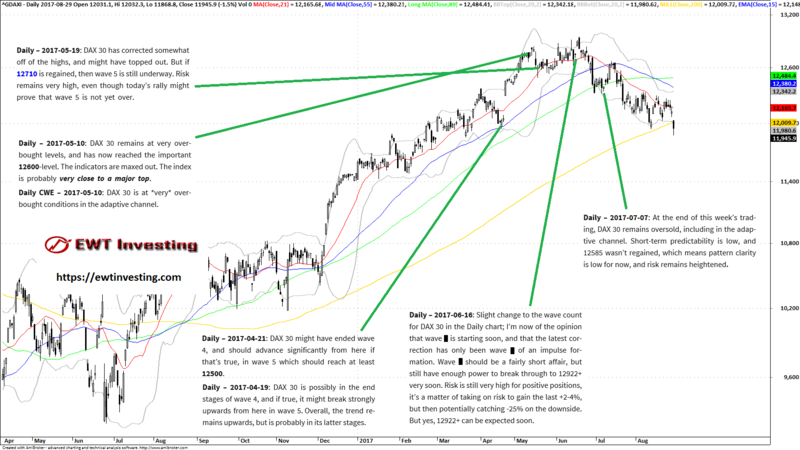 The next significant call was made on the 7th of July, when we noted that an oversold condition had arisen in DAX 30. However, we didn’t make any specific directional prediction from that point on out, because of unclear market structure. On the 12th of July, we made a bad call, from a misinterpretation, where we took the advance to be part of a new impulse which would reach 12900. This clearly didn’t happen, and the correction became significantly larger than we’d thought. This was the only clear miss of the time period examined in this article, but still, a miss. The only good thing about that update was that we reiterated the need for proper risk management, which really came in handy a few days later. On the 21st of July, we remarked that while we believed the top of the advance from 2012 wasn’t in yet, this corrective phase could last longer all in all. That was a decent call; the DAX 30 traded choppily net sideways for a weeks from then on. Also, the call that the index was oversold and would need to consolidate came true. The last update for July was made on the 28th, when we once again called the index oversold, which was followed by 8 days of choppy sideways price action. That ends the summary of our DAX 30 analyses for January 2017 to July 2017. We got most things right with DAX 30 during this time period, but determining the exact extent of both the advance and correction proved difficult in real time. Of course, if it was easy, everyone would be doing it. We only made one serious misjudgement during the entire time period examined here, which is not too bad, given that the market tries to destroy traders and analysts every day. Access to our composite technical analysis of DAX 30, using our Extended Elliott Wave Theory, is available to all subscriber’s to the our Global Elliott Wave Coverage subscription service.